Since we started playing PokemonGO a few weeks ago, the boys have been hoping to catch a Pikachu. They had the chance ONE time, but he ended up escaping the pokeball and running away. One other time we saw him nearby, but never actually came across him. The other day I was baking some cookies, and pulled up the app while I was waiting for them to cook. I caught an Evee, and then saw pikachu. I didn't tell the kids until AFTER I caught him. I went through 1 regular pokeball, 11 great balls and 3 raspberries, but managed to capture him! This probably sounds completely ridiculous to anyone reading that doesn't play the game - but if you DO play, then you know that Pikachu doesn't come around all that often. I doesn't make a lot of sense to me because we don't play it. BUT I do live in a house with game lovers, so I can appreciate the celebration of an accomplishment like that. I am so excited for you but also jealous!! 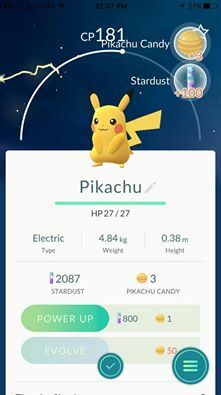 Myself and my sons have been trying to get a Pikachu :) Soon, I hope! !!!!!! The holy grail !!!!!! YAYYY Congratulations! LOL. I'm 30 years old and I'd say almost everyone I know plays.